Your partner in raising the project bar for landscapers, facility managers, and contractors! CRANE [ cran "large wading bird," from PIE *ger- (cf. Gk. geranos, Welsh garan, Lith. garnys "heron, stork"), perhaps echoic of its cry. Metaphoric use for "machine with a long arm" is first attested 1299. Verb meaning "to stretch (the neck)" is from 1799 ], are machines by means of which heavy bodies may be lifted, and also displaced horizontally, within certain defined limits. Strictly speaking, the word "crane" alludes to the arm or jib from which the load to be moved is suspended, but in the wider sense includes the whole mechanism by which a load is raised vertically and moved horizontally. The hydraulic truck cranes utilized by Professional Crane Service (PCS) are used to lift extremely heavy loads using the simple concept of transmitting forces from point to point through a fluid. In a hydraulic truck crane, powerful lifting capacity and high stability are attained through large counterweight that requires no additional clearance. The functional designs make these truck cranes very tough and can stand up to everyday use. Our cranes are simple by design but can perform amazing tasks that are otherwise impossible to perform. Within minutes, these machines can raise multi-ton bridge beams on highways, heavy equipment in factories, remove enormous trees from the ground and even have the precision to place iron statues on their art foundations. A hydraulic truck crane, when in action moves unbelievable weight of multi-ton objects with quite ease. There are various models of hydraulic truck cranes that vary in lifting power. So no matter what the application, Professional Crane Service is your partner in raising the project bar. 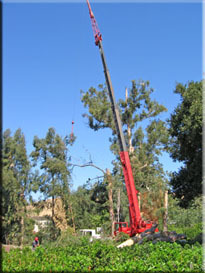 © 2008 Arboricultural Specialties, Inc. dba Professional Crane Service, all rights reserved.